. . . Charlotte, North Carolina. Not Milwaukee. Not Boston. Not Chicago. The largest Roman Catholic parish can be found in the Presbyterian stronghold of Charlotte. You can read about it here. Guess where the largest contingency of Bahá’í live in the United States? Not Massachusetts or California. According to Wikipedia, The Bahá’í Faith is currently the largest religious minority in Iran, Panama, Belize, and . . . South Carolina. There are mosques in Gadsen, Alabama and Madison, Mississippi. There are Hindu temples in Spanish Fork, Utah and Cedar Rapids, Iowa. My point is this: we need to know our neighbors. We should not be surprised to learn that there is a Buddhist Temple in Kannapolis, NC and a Zoroastrian Center in Flower Mound, TX. Instead of being out of the loop or shocked or even outraged that there are spiritual people in our communities whose faith is different from ours, we need to reach out and meet the locals. As people move geographically and spiritually, we are called to pay attention and shift how we best become their neighbors – in the image of Christ. 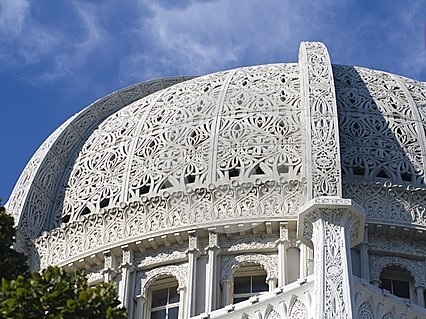 Image of the gloriously beautiful Bahá’í Temple in Wilmette, Illinois. It is one of ten Bahá’í Temples in the world and the only one in the United States.